Fred Haller was born in 1954, with a dream to make a restaurant for families to enjoy. He opened up a diner in 1969 based on a bear called "Fred the Funny Bear", named after himself. Soon it was a success, but the kids were getting bored. Realizing this he bought a few mascot suits from a retired baseball team. The waiters would wear these and entertain the kids. This made the place even more fun. Unfortunately an attraction called "Chuck e Cheeses" came out in 1977 and grew more popular than Fred's Fun Diner. Forced to take a step forward he bought a bigger building, he renamed it: "Freddy Funbear's Diner and added a stage where a band would play. The original characters were called: Freddy Fun bear, Chicklet Chicken, Funny Bunnie, Frances Fox, and a currently unnamed Freddy with a light brown color to it. They were all people it suits first, but it cost too much and they were replaced with animatronics. People started coming back, and they decide to add another animatronic called "Mr. Mouse", but soon after was sued for copying Chuck e Cheese. They were forced to change the appearances and names of the animatronics. The new names were: Freddy Frazbear, Bonnie Bunny, Chica Chicken, Foxy Fox, and the unnamed Freddy called Freddy Jr.,(Mr. Mouse scraped). Fazbear was a typo of Frazbear but the staff kept it anyway. 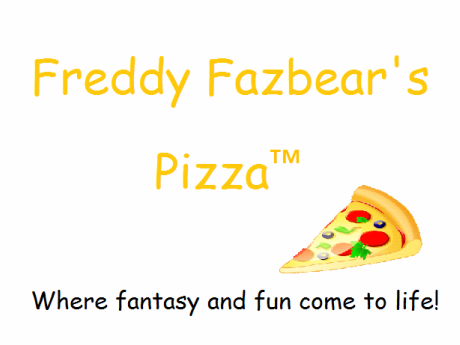 Things went great and Freddy Fazbear's Diner was changed to what we now know as Freddy Fazbear's Pizza. In the 1980's arcade machines were getting popular and were soon added. The animatronics were also redesigned to look more kid friendly and with better AI. Then there was a problem, in August 14th, 1987 a girl had tried to go upstage with the animatronics and fell of stage, fracturing her skull. They were sued and went bankrupt, and the place shut down until 1991, when Fazbear Entertainment used the old animatronics (after cleaning and repairing them) and got another building for rent. The building was smaller and had less room than before but was better than nothing. In 1998 the same parent of the girl filed a complaint and shut us down. But thanks to donations we went up and running in 2011! And that's how Freddy Fazbear's Pizza came to be.